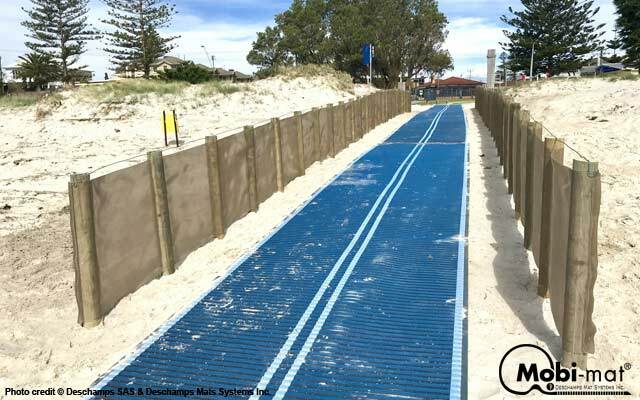 Mobi-Fence™ - Mobi-Mat by DMS Inc.
Mobi-fence™ synthetic seamless windbreak fence provides Erosion control and Protection for coastal assets, roads, paths, houses, parking, playgrounds, etc. 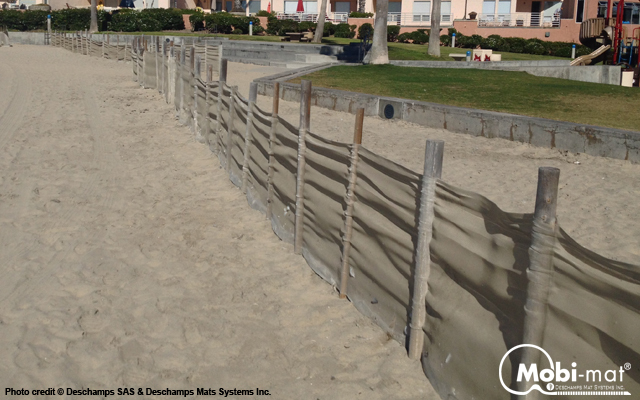 Mobi-Fence™ is a rot-proof multi-layer fabric, made from 100% high resistance recycled polyester, U.V. and seawater resistant. Mobi-Fence™ fabric also has a high traction, perforation and abrasion resistance. 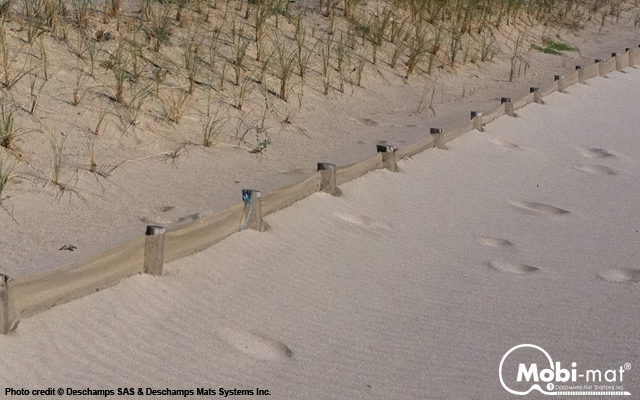 Mobi-Fence™ reduces efficiently wind velocity at the ground surface and trap blowing sand. 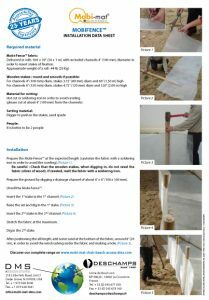 Its small aperture prevents the sand from going through and its high permeability works as windbreak and avoids any “tarpaulin effect”. No need to attach to the stakes, just slide the post in it ! 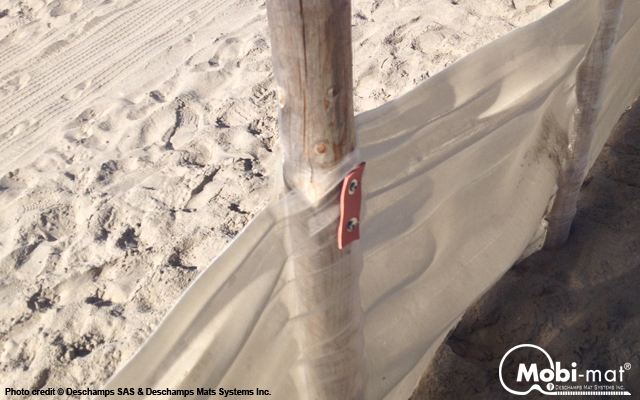 In order to insert wooden or metal posts, Mobi-Fence™ fabric includes innovative 1 m spaced strong and solid seamless woven pockets, not swen, to hold in place the fabric with poles/posts that slide into the seamless pockets woven into the panel, with no need for additional fixation. 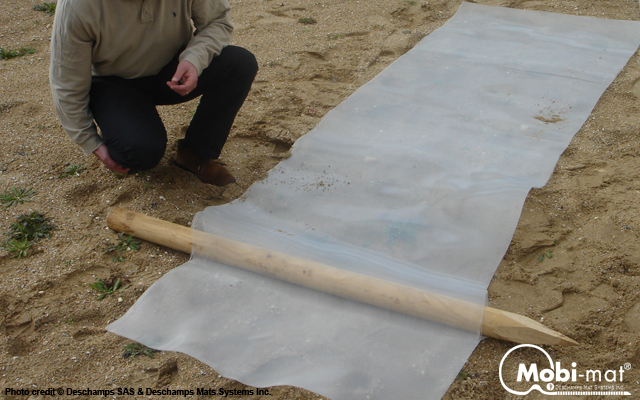 The setting of a Mobi-Fence™ is easy and quick because of its lightness (340 gr/sqm), its flexibility and the pockets included in the fabric in order slide the stakes. Time for setting lies in time for digging in the stakes. The taking out of sand is an expensive operation for collectivities, without speaking about dangers and problems occurred by the sand. 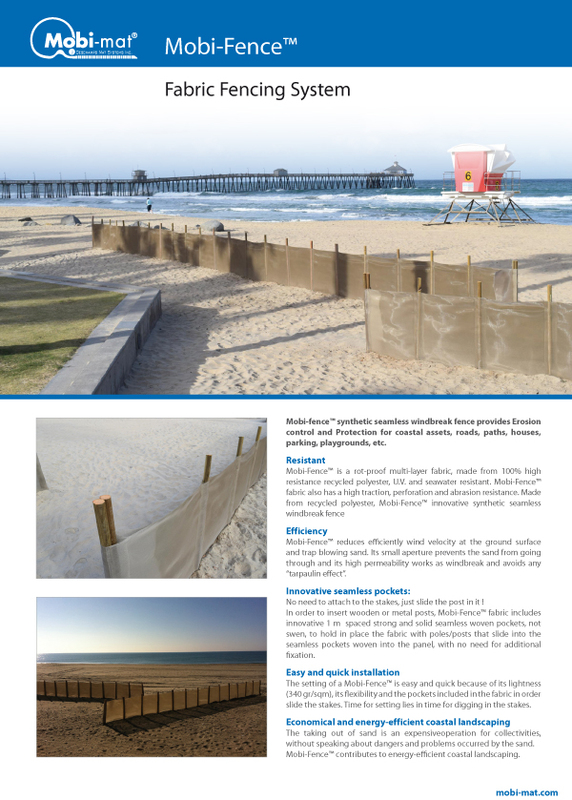 Mobi-Fence™ contributes to energy-efficient coastal landscaping.